The TBS range of knives are made from top quality European materials and are built to last. We have selected some the best steels for the job, the highest quality handle materials and some great leather work to bring these impeccably made knives to the market. The Boar Bushcraft Knife - DC4 & Firesteel Edition is a great knife for the field and ticks all the boxes as you will always have a good knife, the ability to sharpen it and a Ferrocium Rod Firesteel for firelighting. It is handled in Highly Figured Turkish Walnut which is a great wood for the task as it not only looks great it is VERY easy to maintain. The handles are also wonderfully ergonomic and fit the hand perfectly for hours of hard work. The handle is very slightly longer (1cm) than most knives of this type on the market and this allows more flexibility for positioning for different uses or simply a better fit for users with larger hands. 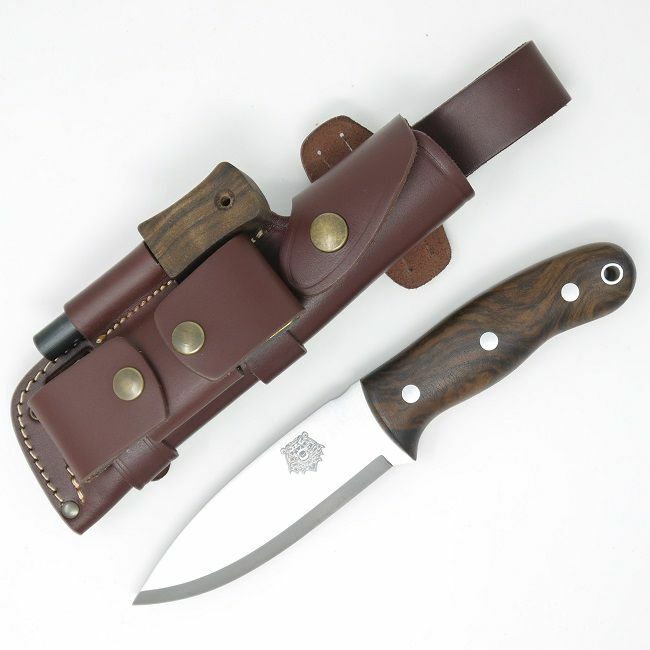 The sheath is a high quality leather product that allow you to carry the knife in the regular way or offers the versatility of being able to be carried a linear fashion along a belt or to be attached to the strap of a bag or even on MOLLE type webbing if need be. The leather addition to the front allows you to carry a firesteel and a DC4 stone (both included) and is also removable to allow you to carry it separately on your belt. Our knife range is manufactured from high quality European materials by a top, well known, European manufacturer in small batches; they are NOT churned out in their thousands in a factory in the Far East. This allows us to have ultimate control over quality and materials and we are extremely happy with the results. The advantage of these materials, although they get worn, will still keep their flat shape this is important when you sharpen your knife. And, since these materials are the hardest we know of, they will sharpen any steel, even these extremely hard powder steels. The firesteel in this model is our own TBS ferrocium rod Firesteel which is the Army model (9.4mm thick) and gives a shower of sparks at over 3000c (5400f). It makes firelighting SO much easier and will give you thousands of strikes. It also comes with its own, very useful striker which has a useful roamer measuring scale and a bottle opener. The striker with this steel gives a MUCH better shower of white hot sparks than the back of your knife. A matching firesteel which is essentially the same product with a matching Turkish Walnut handle. So good I bought 2. After quite some deliberation I took the plunge a couple of years back and bought the Boar (fixed blade version) with walnut handle.. Originally I bought the "kit" with dc4 and plastic handle firesteel. Recently I not only purchased the matching walnut firesteel but I bought a Grizzly with Micarta scales and leather sheath. I have several artisan made knives but these are just so good I keep wanting another, a boar folder is next on my hit list.. If you're are thinking about a new knife, do yourself a favour, stop looking and just buy one of these, you won't be disappointed.. Almost forgot, service and advice is second to none.